Serial leaker Evan Blass gives us a better look at Samsung's upcoming super tablet. We got our first look at Samsung’s behemoth Galaxy View in September during the Gear S2 smartwatch release. Since then, it’s been the subject of numerous leaks and rumors. The latest happened late Monday when Evan Blass, the driving force behind the once highly active Evleaks, published a presumably official rendering of the device. 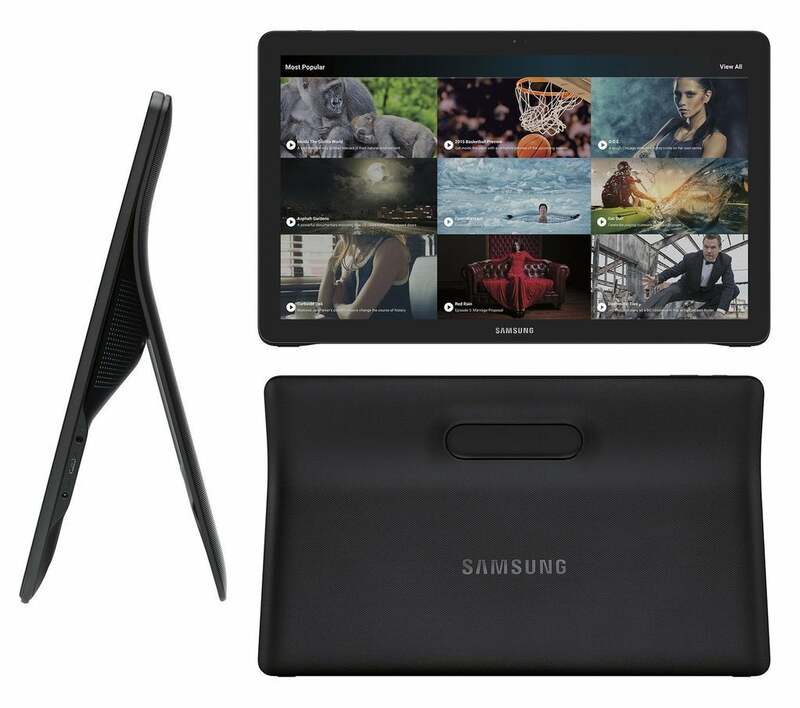 Based on the image, the Galaxy View has a serious curve in the upper back portion of the device and a large Surface-like kickstand in the back. The new images also provide a better look at that bulge in the rear that appeared only briefly in Samsung’s teaser. Presumably the bulge houses some serious audio speakers or is there to keep this massive beast cool. A leaked image of the Galaxy View. The latest rumored specs for the Galaxy View claim it will have an 18.4-inch screen, a 1080p display at 120 pixels per inch, a 1.6GHz Exynos 7580 SoC, 32GB of storage, stereo speakers, 2GB of RAM, a microSD slot that supports cards up to 128GB, and a 5,700 mAh battery. The View is expected to come in a Wi-Fi only model, as well as a 3G and LTE version. As for pricing, the Wi-Fi model could cost around $600 based on a recent leak. The story behind the story: A few years ago everyone was going with smaller tablets like the iPad Mini, Nexus 7, and the Microsoft Surface Mini that never made it out of development. Now it appears larger tablets are a thing. The iPad Pro is about to roll out to store shelves, Lenovo recently introduced the 27-inch Lenovo Yoga Home 900, and Samsung promised us a better look at the Galaxy View in October—which so far hasn’t happened. It’s not yet clear where these mega-tablets are supposed to fit in. Apple is marketing the 12.9-inch iPad Pro as a device for creators and professionals, while the Galaxy View may become part of the long, sordid history of kitchen and tabletop tablets as a solution for consumption, reference, and family organization. Whatever the case, at $600 the Wi-Fi only version has a fairly good price (assuming the leaks are accurate). But if any tablet lives or dies by its battery life it will be the Galaxy View. If that 5,700 mAh battery doesn’t last long enough on one charge, the View will not be pretty.